...along the Inside Passage between Friday Harbor, WA and Petersburg, AK. The Aimee O has been sold, so our on the water courses are on hold till till we find another vessel. Join us for underway navigation training aboard the F/V Aimee O... with excellent food and beverages, wonderful scenery, real-world navigation training and experience along some of the world's most renowned waterways onboard a modern commercial fishing vessel during her off season from fishing. 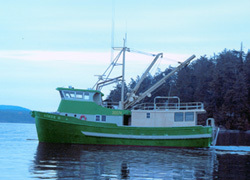 New: the F/V Aimee O has moved on to other waters and will be concentrating on full time fishing. We will be using a new vessel for future onboard training. Our 2009 scheudle will be posted shortly. We also plan to reactivate our South Sound 3-day trips this Fall. This will be in a different vessel. Details will be posted when avialable. Eight-day course N2 is $2,750 per person (sharing a cabin), or $4,800 per cabin (couple), $5,800 per cabin (family of 3). Nine-day course N1, S1 is $2,850 per person (sharing a cabin), or $4,900 per cabin (couple), $5,900 per cabin (family of 3). Fee includes all meals and our Onboard workbook and annotated map of the Inside Passage. Ground and air transportation are not included. Onboard courses are limited to 8 students (although vessel is certified and safety equipped for 12 passengers). Join us on the working commercial purse seiner F/V Aimee O, with excellent food and beverages, wonderful scenery, real-world navigation training and practical experience along some of the world’s most renowned waterways. Navigation is done by both state of the art GPS and e-chart navigation as well as traditional log, compass, and paper charts, with special emphasis on the practical hands-on use of radar. We also cover boat handling and engine room procedures. Individual instruction occurs in daily sessions during watch standing directly with the skipper, and our Onboard Exercise book can be used for further practice on the off watch (watch standing and driving are of course voluntary). The first mate (besides running a gourmet galley) is also a wealth of information on the route itself and practical boat handling. Both trips offer plenty of private time for reading, nav practice, and sightseeing underway. If we are on schedule, we can break out the shore boats for some local anchorage exploration. The 2007 trips will mark our fifth season of offering this unique training opportunity. Navigation along the Inside Passage and its extensive network of alternative routes through narrow channels and island gaps has been legendary for 100 years. During this trip you will confront and master navigation challenges that most mariners only get to read about. This is a 13 MB zip file of 50 photos. The skipper and crew are familiar with the history and natural science of the routes covered, and the ship's library is filled with texts on the routes and related topics. Rowing and motor skiffs are on board for harbor exploration at anchorages along the way as time permits. At the end of the voyage, you will not only have the direct navigation experience, but you will also know the route well for future voyaging on your own, not to mention the general experience of getting a large vessel in and out of isolated anchorages. Yes indeed. Many of our onboard students are sailors and plan ocean and coastal voyages with their own sailboats. Some plan to return to the Inside Passage on their own after this trip. For the most part, navigation is navigation, but here the experience to be gained is exceptional. What you will learn on this voyage applies to any vessel... and, as you will see, for actual instruction underway, the large, high wheelhouse with essentially 360° visibility and large salon area of this vessel are much better suited for learning navigation than a large sailing vessel would be. As many as six participants can work comfortably in the wheelhouse, which includes the same type of instrumentation you would likely use on your own vessel. If you have family or friends that may not be interested in all of the navigation training, they can still sign up for the 8-day voyages and only participate to the extent they wish. See full-cabin discounts under course fees. This voyage alone—without all the extra navigation training—is still a most wonderful and economical experience. The Inside Passage to Alaska is a magical place. We visit places never seen by the cruise ships, nor many vessels of any class for that matter. We catch fresh crab and shrimp, we see totem poles, waterfalls, eagles, whales, bears, and other wildlife that abound in this spectacular environment. This is adventure travel at its finest. There are two flights per day between Petersburg and Seattle. Total flight time is about 5 hr on Alaska Airlines. There is car and passenger ferry service as well as float plane service to and from Friday Harbor and Seattle (see Kenmore air) They also offer a scheduled shuttle service between Seattle and SeaTac airport. Course N1 is from Friday Harbor to Ketchikan, AK via Princess Royal and Grenville Channels. Point to point is about 400 nmi, plus diversions to anchorages and sightseeing. This is the famous "Inside Passage," written about extensively and used by fishermen and other commerce and travelers throughout the maritime history of the Pacific Northwest. An Internet search on "Pacific Northwest Inside Passage" yields hundreds of photos, articles, and books about this fascinating waterway. Course N2 is from Ketchikan to Petersburg, AK around the west side of Prince of Wales Island and through El Capitan Passage. A diversion from the normal route to seek out extraordinary scenery and navigational challenges. Point to point is about 300 nmi, plus diversions for anchorages and sightseeing. Much less is written about this area, as many fewer outside vessels have ever been there. The Alaska Coast Pilot (available online) has some information. Both routes offer numerous alternatives that might be needed in various wind or tidal current situations. Generally we run during the day only, finishing in time to explore around the anchorage, but we like to get in some nighttime navigation practice as well. If we are held up by weather (or whale watching! ), we can make up the time by an overnight run, or a couple of longer days. Route N1 will tend to interact with more vessels for radar practice with traffic and have more time in the pilothouse. Route N2 has more narrow-channel navigation and if we are on schedule, more time available at anchorage or for sightseeing. Both routes must be planned on a daily basis to best match the present conditions of wind and current... and desires of the participants. Complete information and applications are in the "8-day info pak," which can be downloaded above or from our downloads page. "...This was first rate quality all the way around, from the thorough and competent training and instruction to the wonderful meals prepared each day. ...We would not hesitate to recommend this course to anyone wanting the best in hands-on instruction in a real-world situation." "...nothing less than the best crew ...Steve Lowney was amazing and brilliant as an instructor ...I had an incredible time ...We're spreading the word!" "...The trip met all of my goals about onboard navigation ...He did a fantastic job ...a very worthwhile trip." "...I thoroughly enjoyed my trip on the Aimee O ...Teaching/learning was accomplished in a low-stress environment ...I will not hesitate a nanosecond to recommend Starpath! ...I really learned a lot ...I really had fun"
"Steve and Aria did a great job! ...you couldn't find a better captain and first mate/cook anywhere in the universe." "We had a wonderful time! ...and I learned a lot. Steve taught me a lot about close piloting a large boat, anchoring and radar...just being completely out of touch in that magnificent landscape was worth the trip!"